Should I Get a Second Cat? Are You Prepared for More Than One Cat? We are social animals, so it just seems natural to us that our cats would enjoy having companions, too. With few exceptions, though, wild and domestic cats lead mostly solitary lives. They can get along in groups, but given their druthers, they don’t seek out buddies. 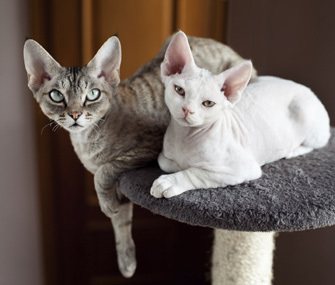 Before you decide to add a second cat to your family, ask yourself if your cat really needs a friend — and if you are prepared to meet the needs of a multicat household. There are two important things to consider before adding a second cat to your family: your current cat's age and his personality. People often ask me if they should get a kitten to help liven up their older cat. That’s probably a senior cat’s worst nightmare: his peaceful existence shattered by the antics of a wee ball of energy. A young or middle-aged cat may be more receptive than an elderly cat to the presence of a kitten or even another adult cat — but it’s important to consider your original cat’s purr-sonality when choosing a new cat of any age. A shy cat could be overwhelmed by a bossy cat, while a bossy cat may be likely to bully a shy cat. If you do add to your feline family, choose a cat who seems outgoing but not over the top. Sometimes people who have a shy cat — the kind who hides under the bed when people come over or runs at the sound of the doorbell — assume that he just needs a friend to bring out his inner party animal. I’m here to tell you: That’s the last thing he wants. In fact, it's entirely likely that the new cat will take over and make himself at home in your lap while your original cat spends more time than ever under the bed. Now, none of those facts mean you can’t ever have more than one cat. In fact, sometimes adding a cat to the family is inevitable. If you’re getting married, for example, and you and your spouse-to-be both have cats, a merger is a must. But if you’re just getting started in the business of adoring cats and you think you’d like a pair, the best thing you can do is to acquire two kittens from the same litter or adopt an already bonded pair. Cats don’t learn to share in kitty-garden, so double the cats means double — or, in the case of litterboxes, triple — the cat stuff. If you plan on adding another cat, you’ll need additional toys, additional food and water bowls, and two additional litterboxes. The rule of paw is a litterbox for each cat, plus one extra, preferably in different areas, to ensure that they don’t fight over this valuable piece of property. A tall cat tree with multiple perches is also a good idea.